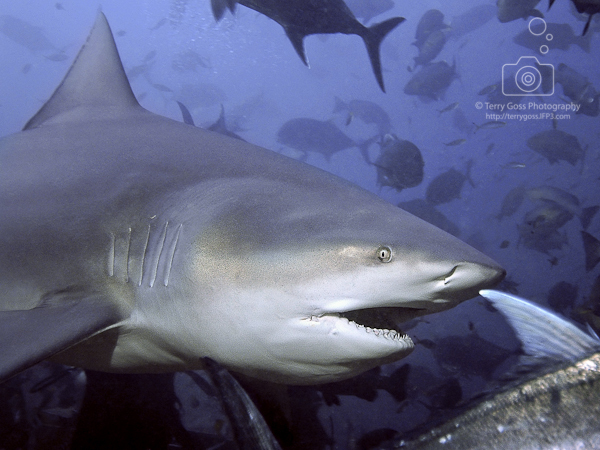 The shark that is going to be described is perhaps, with the tiger shark (Galeocerdo cuvier), the most dangerous and particular of the known sharks, because of his muscular power, of a curious and indomitable nature, of an extreme opportunism during the feeding and above all because of his ability to swim both in sea waters that in sweet waters (rivers and lakes). Let's learn therefore all the necessary information about this splendid animal, without fear for him, but only with the correct respect towards a sea creature that lives in his kingdom. Shark with strong structure and short and stumpy face. The small dimensions of the eyes make think to a smaller importance of this sense of this animal, becouse often this shark is present in turbid waters, with reduced visibility, especially in rivers and lakes. The first dorsal fin is wide and triangular with the pointed edge. Also the pectoral fins are great and the caudal fin has the superior lobe mostly developed, compatible morphology with the tendency of this shark to the swimming and standstill near to the backdrops. 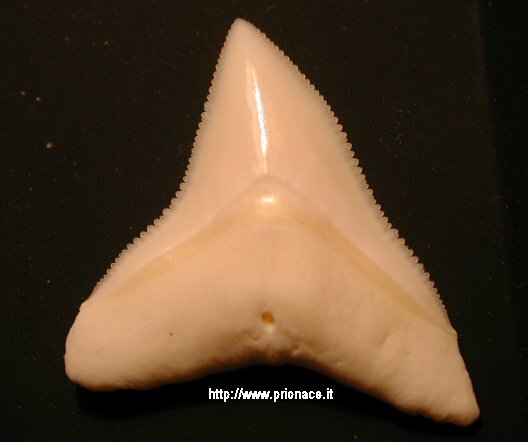 Teeth are triangular, wide, elegantly serrated, more narrow in the inferior arcade, valid offensive elements to attach any type of prey..
As already mentioned it has a very curious nature, audacious and resolved and this shark can reach notable dimensions expressing a great muscular power with fast and mighty releases. 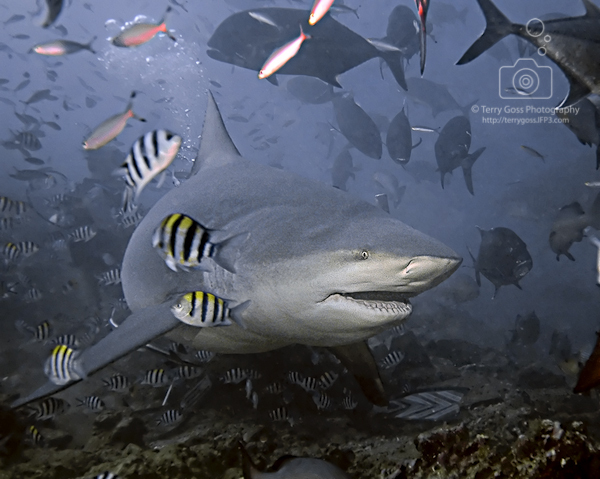 Zambesi shark feeds a great variety of preys (comparable only to that of the tiger shark, Galeocerdo cuvier) among which: bony fishes, sharks and races, sea turtle, sea and earthlings mammalian (livestock, dogs, rapes, antelopes) shellfishes, molluscs, birds and organic refusals. 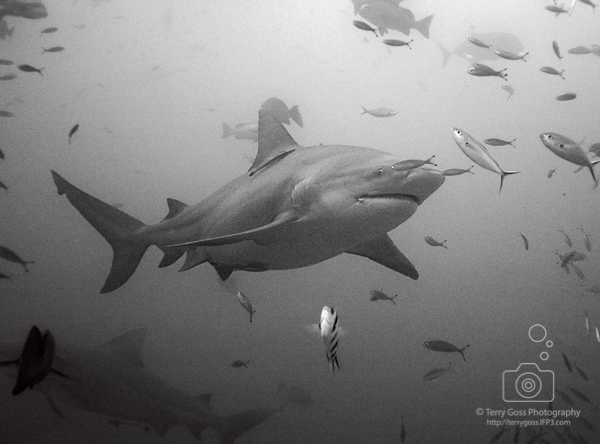 As regards the distribution, the zambesi shark is present in all the tropical and sub-tropical seas, from the surface up to 150 m of depth, middly around the 30 m. it stirs without problems between sea waters and sweets ones, going up again the mouths of the rivers, thin to reach the lakes, it would also seem for pregnancy. 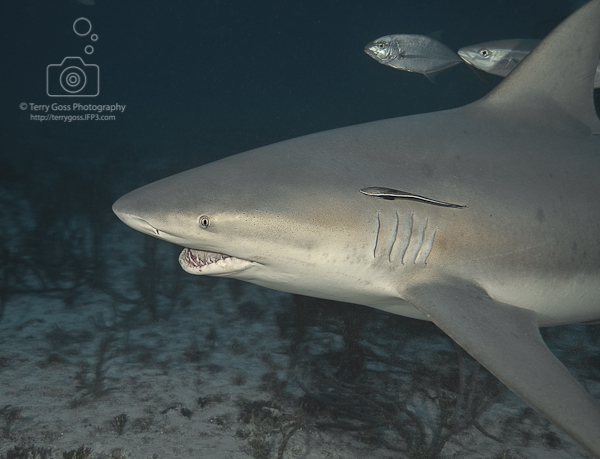 The Bahamas islands and above all the island Walker's Cay is famous for the presence of numerous zambesi sharks, by now a fixed population, present on the low sandy backdrops that surround the island, to few meters deep, often in "sleeping" position.. The rivers in which it is mostly present the Carcharhinus leucas are: Zambesi (from which the name) and Limpopo in the South Africa, Tigers and Shatt-el-Arab in Iraq, Gange (India), Mississipi (that goes up again for more than 2000 km) and the Rio delle Amazzoni (that goes up again for more than 4000 km from the mouth). As it regards the lakes, the zambesi shark is continually sighted in the lake Nicaragua, where a discreet permanent population is present, in the lake Jamoer (New Guinea) Macquaire and Swan, Brisbane, Herbert (Australia). This shark is able therefore to bear, introducing an interesting evolutionary adaptation, great variations of salinity, element that contributed to make him, together with his power and innate curiosity, very dangerous for the man. Different attacks of Carcharhinus leucas has been described to swimmers, in sea, lakes and rivers, also to low depths but never to scuba divers in immersion..
1) the youngest sharks can have the terminal part of the fins hemmed of black and thet not rarely go out out of the water with powerful leaps, probably to try to free themselves from parasitic. 2) the zambesi shark is a very strong animal, able to adapt himself and also live in captivity, in fact different Carcharhinus leucas have been kept in great aquariums for more than 10 years. 3) this special shark is also indeed very sought from the commercial fishing for his meats that are appreciated both fresh and smoked, for the fins, used forr "soup of shark fins" and for his liver, rich of vitamins. The carcass is used to realize animal foods. 4) also the non commercial fishing assembles him on this fish, especially in the waters of the Gulf of Mexico and in South Africa, where great tournaments of capture are organized (big-game fish). In the male sharks the terminal part of the pelvic fins, (equal fins that have the function to stabilize the rout of the animal) become longer and it calcifies more and more to form the claspers (two), the sexual organs through which the shark reproduces himself. The reproduction is internal and appen with the introduction of a clasper (the other one is a backup) in the cloaca of the female shark. This is a very bloody moment, in fact the male repeatedly bites the female on the fins and on the back to stimulate her/ and to hold her firm. 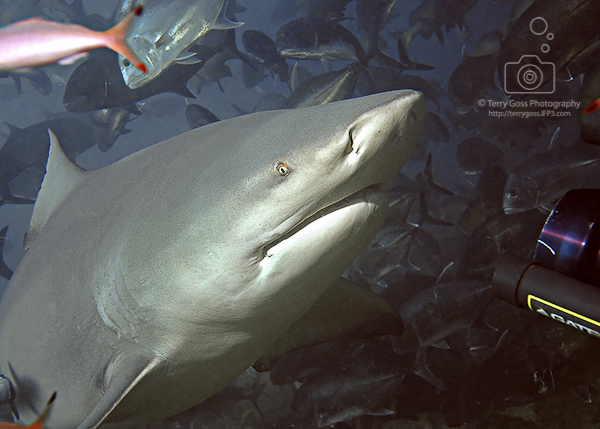 Around the 30% of the sharks has a oviparous reproduction, that is when the female deposes outside the eggs; around 50% has a aplacental viviparous reproduction, that is when the female produces the eggs that develope inside her body and the small sharks go outside completely formed; the remained 20% has a placental viviparous reproduction, that is when the embryo is in contact with her mother through a primitive placenta. of text and photos without the consent of the authors.